It's end of May. We have been enjoying some very warm days this Spring. But last night it started to rain and the chill is in the air. Prefect day to cook something to warm the bones. Batatas Chtitha b'merguez or Algerian potato stew with sausage comes to mind. (Also called batata harra or chtitha bel merguez) It's simple, fast, uses very few ingredients and slightly piquant enough to "dance" in your mouth and warm your bones. This type of dish is actually inherited by the Turkish Ottoman cuisine and similar variations can be found all over the Mediterranean and Eastern European. Including my native country Hungary, where it is called "Paprikàs krumpli". Batatas Chtitha is basic dish using the spicy red tomato and pepper based sauce called "Chtitha" (pronounced shh dead ha) typical to Algerian cooking. From this basic dish you can make several others by adding a few extra ingredients which very different and interesting results. Today, I am using merguez in my dish to give more of the spicy, Earthy tone from the merguez. Here I am used homemade turkey merguez sausage since this is what we prefer. But you can easily use store bought ones made from mutton or beef. Or any other type of sausage. I will post the merguez recipe in the future. Prepare the dersa sauce, by mincing the garlic very fine then add in the rest of the "dersa" ingredients. Traditionally here in Algeria, dersa is prepared in a mortar and pestle. You can easily prepare it in a robo or in a small bowl. Sauté the onion in the oil. Once golden, push the onions aside, then add in the dersa to caramelize in the oil for a few minutes. This gives an extra depth of flavour. Now add in the potatoes. Coat the potatoes well in the dersa and oil, and allow to brown for a few minutes. This will give you also another level of caramelized flavour. Now add in the merguez and enough water to cover the ingredients. Cook on a low heat for about 15-20 minutes or until the potatoes are tender. The sauce will be reduced and slightly thick, but should not be too thick where it is soupy or the potatoes have disintegrated into the sauce. This is one pot meal, nothing much is needed extra to round out the meal, but traditionally in Algeria crusty bread is served to use as an utenstil and sop up sauces. Optionally serve a small plate of olives or pickles to balance the richness of the sauce. 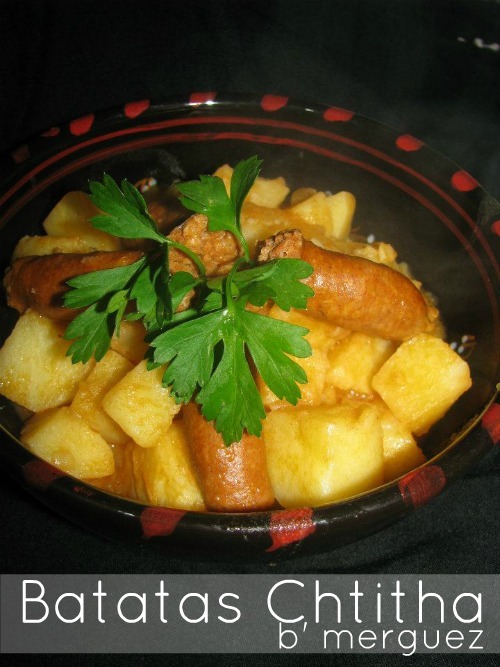 To make this dish vegetarian, Batatas Chtitha, omit the merguez when preparing this dish. Optionally add vegetable stock instead of the plain water for a more flavourful stew. To make Batatas Fliou (potatoes with pennyroyal), omit the merguez and add 3 beaten eggs plus a handful of chopped fliou (pennyroyal) or even basil once the potatoes have cooked. To make Batatas Chtitha Djej (chicken and potatoes in piquant sauce), add in a few morsels of chicken, after caramelizing the dersa. Then once the chicken is almost tender add in the potatoes and a handful of pre-cooked chickpeas into the sauce. To make Batatas Chtitha b' kofta (meatballs and potatoes in piquant sauce), prepare the recipe above, but instead of merguez add in meatballs. To make Djouez Batatas b' selq (potatoes and spinach), prepare the recipe above, omitting the merguez and add 500g fresh (or 300g frozen) spinach in the last 10 minutes of cooking the dish. To make Tadjine Topinambours, replace the potatoes with Jerusalem artichokes and add sweet shelled peas into the sauce in the last 10minutes of cooking. Additional optional add-ins would be (halal) salami or smoked sausage like kolbasz (kielbasa). Let's keep in touch! Sign up for posts delivered right to your e-mail inbox or subscribe to my feed. You can also 'like' me on Facebook,for all the latest recipes and updates or pin along with me on Pinterest . Esalaam Vala and thank you for commenting. Enchallah try this dish, it is very easy and satisfying with sausage, chicken or even alone. B'sahtkoum - bon appetite!